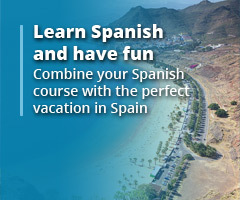 When you set your heart on something, you go looking for it and, when that’s a language course in Spain, you need to know your current level with the Spanish language and what you want to achieve on the ‘right course for you’. Once these two points are clear, you can move on to finding a course which will meet your needs and is also within your budget. Well, that seems easy enough but what if you are trying to find the right course, at the best price, for a group of eager students? Oh, I can see an Excel spreadsheet coming on, to take in all of the permutations of what each and every group member wants. And also what each and every group member doesn’t want. Nightmare! While you’re taking in all these permutations (e.g. 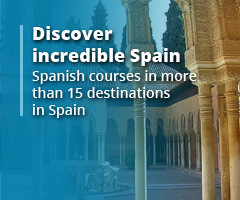 which part of Spain, what level of course, duration of course, places to visit, individual budgets etc. ), you’ll probably find yourself trying to find an easy way out of the headache and that’s where thinking laterally comes in. How many people are in the overall group and, taking into consideration the wants and don’t wants of these eager students, should you split the interested parties into smaller but more likeminded groups? You really should split into groups as regards to language level but you could also split according to location and season, expectations, leisure interests and even age, all making it easier to identify the needs of the more honed group. It will be much easier to find a suitable course for a smaller likeminded group but should you take this responsibility on board yourself, or should you call on the experts to tailor the course? The thing about experts is that they know where to look, they have created professional relationships and, through that experience, they will no doubt have agreed discounts for certain services. Networking means knowing who provides what and using the same company regularly creates good relationships. So, while you’re trying to find an easy way out of that headache, doing some research on language courses might indicate that getting ‘someone in the know’ to do the spadework is the sensible route to take. It’ll almost certainly prove to be the cheaper option, even though you will be paying for that professional service, as fewer (if any at all) costly errors will occur in the master plan for your group. Achievement means different things to different people, so getting an ‘all singing, all dancing’ course which will meet everyone’s needs won’t be easy. Some people may feel as though they are being pushed too far, whereas others will feel as though they’re not being stretched enough. This could be another nightmare and a clear indication that ‘someone in the know’ should be handling the situation. Companies like UniSpain are leaps and bounds ahead of you, the novice, and maybe deciding to use this company is as far as your research needs to go. Have a look at the site, mooch round the pages and decide if what you see ticks all the boxes for a successful group course at the best price. This company could prove to be the one stop shop which will help meet those desired results.